Scientists believe that breaching and slapping play a role in both long-distance and close-range whale communication, since the resulting sounds can travel enormous distances. 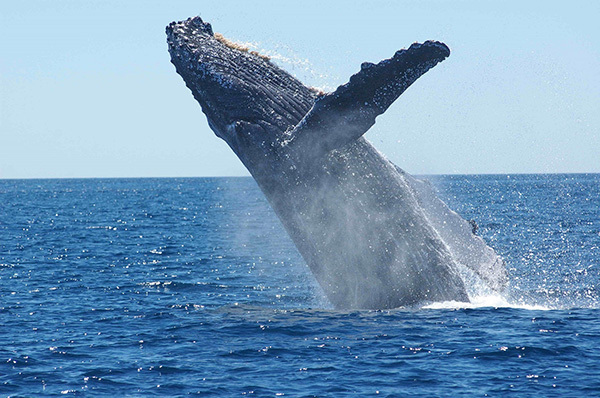 When going out into the Sea of Cortez, California, with the intended purpose of doing some whale watching, it’s probably not all that unusual to actually come across some whales. However, finding a dead humpback is rarely in the plan. But that’s what happened to Michael Fishbach—co-founder of the Great Whale Conservancy with Gershon Cohen, PhD—and his boating companions. A whale was spotted floating in the sea; but upon closer examination, Fishbach discovered she wasn’t dead after all but rendered immobile by entanglement in a quagmire of gill nets. Her pectoral fins were pinned and her tail had been weighted down about 15 feet. After more than an hour of cutting, Fishback and friends managed to set her free. As Fishbach’s boat pulls away, watch as the whale, nicknamed “Valentina,” expresses her thanks. Absolutely beautiful . . . Thanks for sharing this incredible video. What an opportunity, to be able to give back a chance at life to this magnificent creature! good job,,,,that would really make your day.